The Avocado Chicken salad at Rose Park Roasters' Downtown location. Photo by Brian Addison. 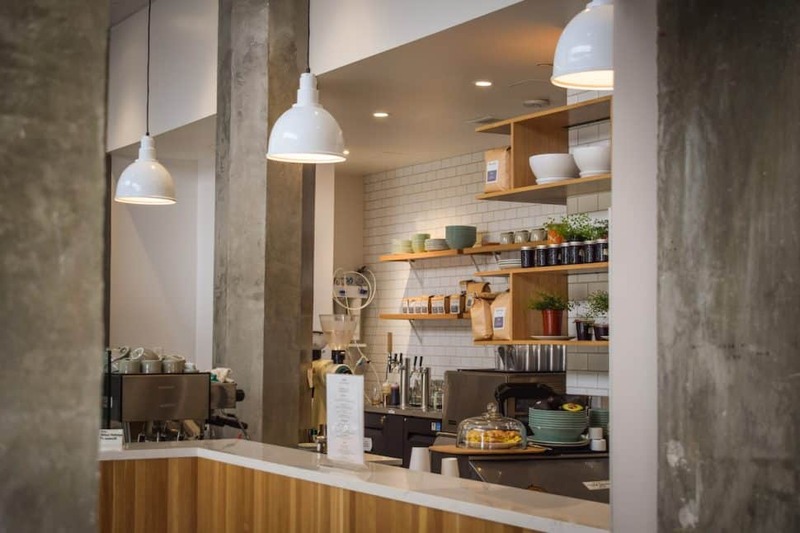 Nathan Tourtellotte, half of the two-man team behind Rose Park Roasters, is placing his bet on the idea of the California bistro when it comes to the coffee shop’s new, second Downtown location. The one distinction in Californian cuisine—outside of the fact that it exists as a constantly evolving, multi-faceted concept more than a strictly defined “cuisine”—are its bistros. And these bistros take from, well, every other cuisine while pinballing off the environment, resources and people around it. Often intimate, often a limited menu driven by quality and creativity, often neighborhood-y, the Californian bistro is ubiquitous in practically every city in the state—minus Long Beach, where it is safe to say that Restauration (which we’ve temporarily lost) was the sole representation of the idea. This local lack is where Tourtellotte is focusing his efforts. The detail inside Rose Park’s (rather sweet) new location at the northeast corner of Eighth Street and Pine Avenue is wonderfully hidden from the lazy eye. To notice the time invested by designer Ruthi Daugherty—a minimalist by any measure—requires one requires sit and observe for a while. Tucked inside the historic Long Beach Professionals Building, it represents both Rose Park’s aesthetic as well as the residents’ long-held desire for more local businesses to set down stakes since nearby food and drinks are nearly non-existent save the Los Compadres near 12th Street and Pine Avenue. The interior Rose Park Roasters’ Downtown location, with the Avocado Chicken salad in the back and Jam and butter toast in the forefront. Photo by Brian Addison. Still tinkering with the menu, Executive Chef Brooke Webber is “obsessed with the earth,” letting ingredients—be they foraged abalone mushrooms from the Oregon Coast or herbs she grows herself—own the marquee. 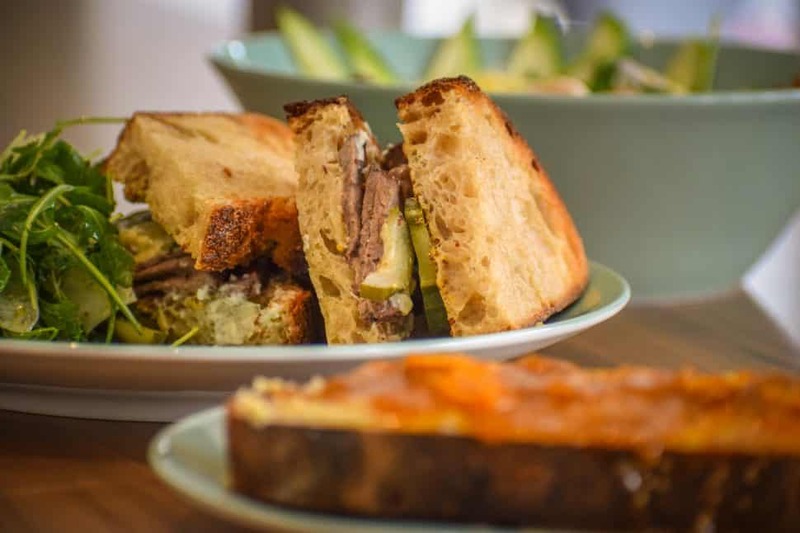 The Le Payson prime rib sandwich at Rose Park Roasters’ Downtown location, with the Avocado Chicken salad in the back and Jam and butter toast in the forefront. Photo by Brian Addison. In addition to her love of earth, is Webber’s unspoken love for simplicity. Take her toast. Yes, toast. Echoing establishments like the aforementioned Republique—a compliment I rarely give—this simple hero of a plate is a thick slice of Long Beach-based Gusto bread slathered in, as I decided to choose, house-made gooseberry jam and house-made cashew butter. The jam, a delightful roller coaster of sweet, tart and bitter thanks to dried gooseberries and a hint of anise to go with the preserves, is a slick partner for the thick nuttiness of the cashew butter. In other words, the ingredients shine. And before we venture down the slippery slope of how sound bite-y and redundant “ingredient-driven food” is, it is safe to say that Webber doesn’t hide ingredients. Rather than use the common technique of creating mystery in dishes—chefs like to play with magic while making patrons guess the exact potion of ingredients used—Webber lets the colorful array of nature’s picnic basket sit naked on a plate. 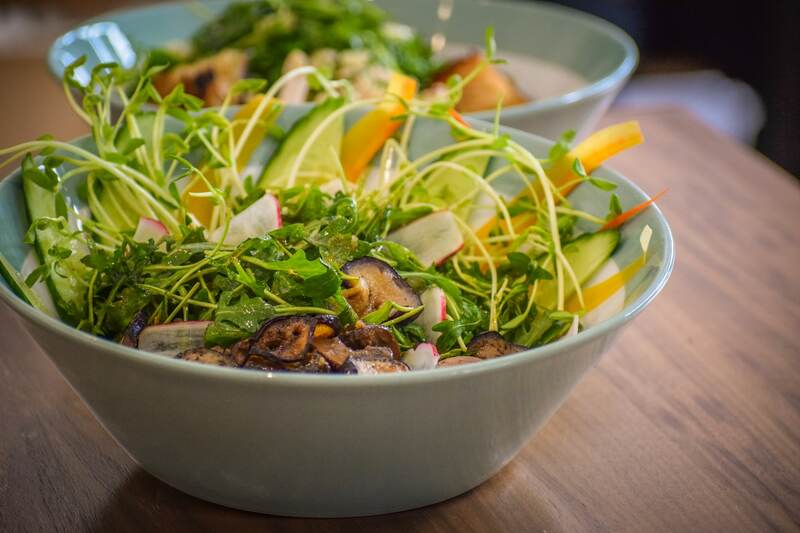 The vegan Miso Lemon Ginger salad at Rose Park Roasters’ Downtown location. Photo by Brian Addison. Pickled carrot. Strands of pea shoots. Bunches of baby arugula. Slivers of fennel. Shaved radishes. Her kitchen is, indeed, choreographed and easy to witness given the kitchen is open to observing patrons while they order coffee and/or food. What they see is Webber effortlessly bouncing between ??? while directing two folks working beside her; tossing, cutting, creating. In other words, to let food truly be “ingredient-drive,” you have to have structure to create the art. And Rose Park’s first full food menu is Webber’s gastronomical ballet. The Herb Aioli and Chicken sandwich at at Rose Park Roasters’ Downtown location. Photo by Brian Addison. How does this play out with something as common as a chicken sandwich? Webber deconstructs it in a sense (not like this though): She removes the skin from the meat, not to avoid the fat or toss it but to fry it into one big, flat chip with hints of only pepper and salt to let the flavor of the skin itself come through. That is added onto layers of baby arugula and soft chunks of protein, where bits of tart mustard seed (from mustard she creates herself) peek out of two pillowy-but-sturdy slices of Gusto bread. It’s a fried chicken sandwich that is somehow airy and light. That comes out not just in her food but how she acquires it. The granules of salt you’ll find in a salad come from the West Coast’s sole salt purveyor (and yes, before you ask, different oceans produce different salt). One of her distributors uses an umbrella of farms to gather from so as to not over sell loversellsources. And, as mentioned, her bread comes from around the corner. 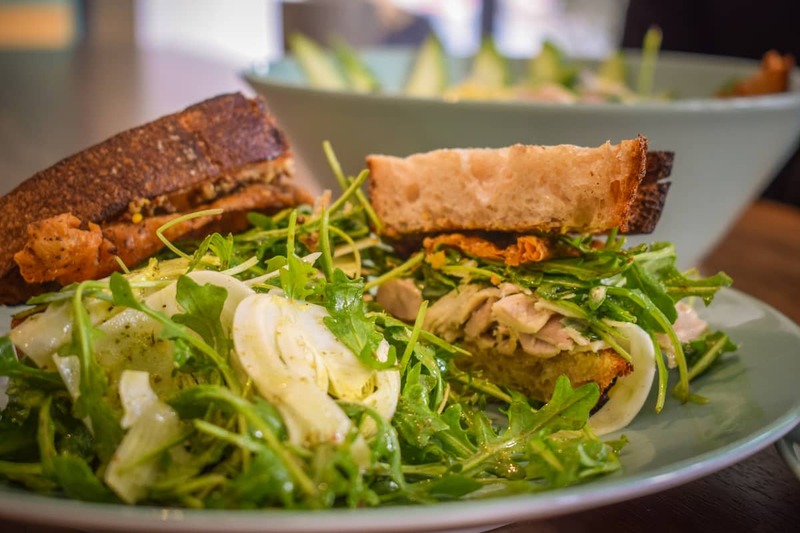 The Miso and Lemony Greens salad at Rose Park Roasters’ Downtown location. Photo by Brian Addison. The prime rib sandwich, also smushed between Gusto bread, is a subtle but wonderful nod toward Webber’s love of the tart. Instead of sticking to raw horseradish and cheese alone as accoutrements, Webber stirs in some crème fraîche with the horseradish on one side of the bread while adding that grainy, sour mustard on the other side, with the meat’s succulence and the aged gruyère’s earthiness, the sandwich is finished off with more tart by the way of house made pickle (dill, not that sweet nonsense from the South) that ultimately come together with the buttery texture and flavor of the bread. In other words, it’s a fantastic sandwich; one that reminds me of the balanced perfection that Italy and Mexico have mastered in their casual eats. The salads offer some of Webber’s most shining examples of her love of herbs, veggies, and grains over spices and heavy protein, even with creations like her chicken avocado salad. An ode to what is easily California’s go-to combination, this hearty bowl of greens is a creamy, dreamy delight. A Green Goddess-like dressing is combined with shaved radishes, red onion and baby arugula before being topped with crumbles of parmesan and sunflower seeds that provide a nutty, textured contrast to the dressing and avocado. The chicken becomes a side component. 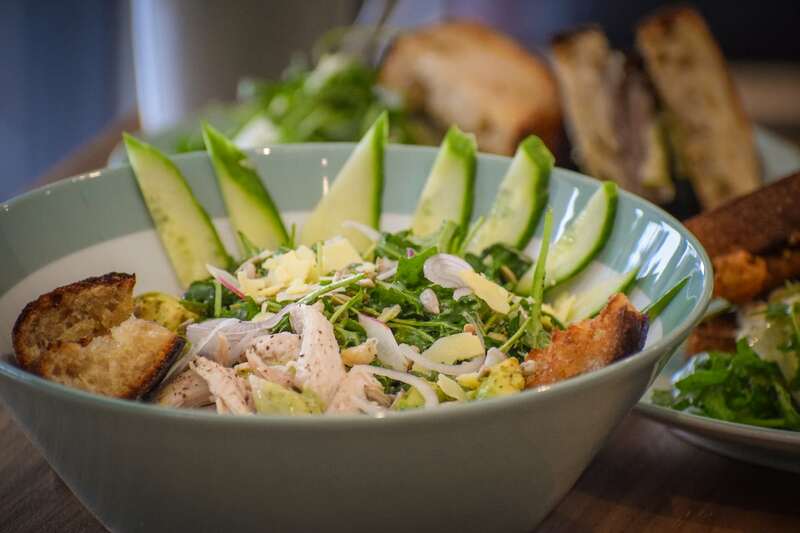 The Avocado Chicken salad at Rose Park Roasters’ Downtown location. Photo by Brian Addison. Her white bean salad, where healthy dollops of cannellini beans are tossed with tricolor quinoa, is another stand-out ode to nature’s best. 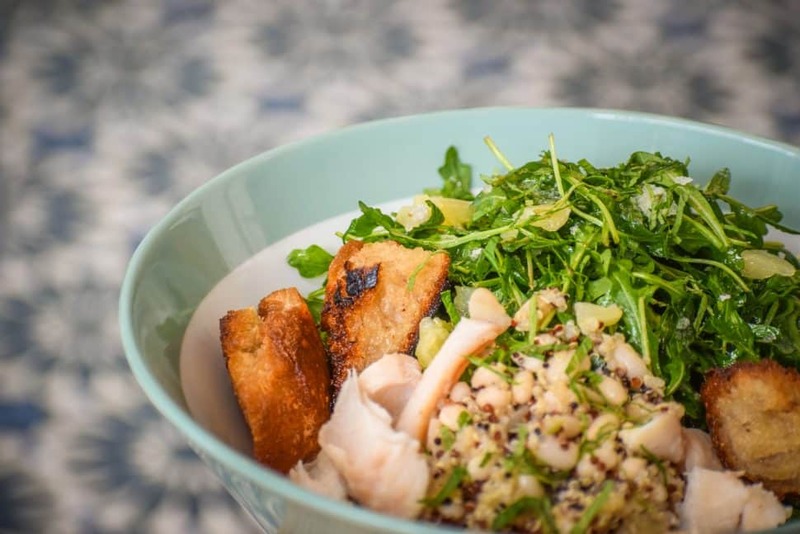 Tiny slivers of sweet, tart citrus are tossed with bitter and fragrant baby arugula, each of which give way to chunks of the best smoked fish I’ve had in Long Beach lining the bowl. And yes, one can order it without the fish to go vegan. Speaking of vegan, Webber offers a vegan sandwich—with coconut “meat”—and a vegan salad with a nod to Asian influences, eggplant and mushrooms marinated in a soy-ginger concoction offer up both a hearty and healthy salad that doesn’t feel like a chef threw it on the menu to Appease The Vegans. Instead, it is a thoughtful, flavorful dish that could stand on its own, whether its eater is vegan or not. Rose Park Roasters is located 800 Pine Ave.